Some sixth months back, we caught wind of a collection of official Rockman children's furniture from the early 90's; a miniature shelf, desk, a closet and... a chair. 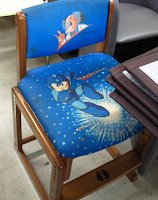 Itoki Design, those responsible for the production and distribution of these obscure products, are apparently behind the likes of a whole set of Rockman branded chairs, which have gone on to garner a small cult following. 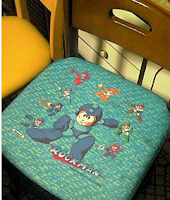 Now viewed as collector's items in their native country, it is said that a total of twelve variations of Rockman chairs were produced throughout the early to mid-nineties, three of which have actually surfaced online. The leftmost chair is probably the most noteworthy: it's a toddler's high chair. How friggin awesome is that? They're just chairs, who cares? Well to you, maybe, but its the nostalgia -- the sentimental value of these items that makes them priceless in the eyes of fans who grew up with the blue bomber. You play his games, you buy his toys, and you do your homework whilst sitting upon his face. 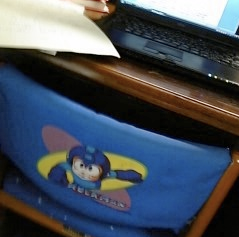 Rockman was, for some, childhood itself. Your best bet at securing any of Itoki's Rockman products is likely through Japanese auction houses, namely Yahoo! Auctions Japan. Browse their selection every-so-often and you might just stumble across something of interest. You can make a copy and scanned it then do it yourself. There are some kits at craft store and it is cheaper than this one. Awesome. I would have loved to have a Rockman chair growing up.